Originally uploaded by Mike A.. I upgraded the hard drive in my tivo this past weekend. The old 40GB drive made a constant, high-pitched whining noise that has been bugging me for a long time. I had to go to Fry's to pick up an external hard drive for my wife, so upon seeing a $40 160GB internal drive, I decided to take action and relieve tivo of its misery. I followed the step-by-step directions at Interactive TiVo Upgrade Instructions. 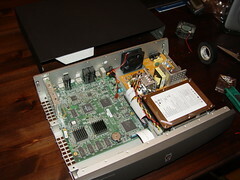 It was a fairly simple procedure: remove the hard drive, attach both drives to my old PC, boot the PC with a special linux boot CD, run one command to initate the data transfer, and attach the new drive to the tivo. I also changed the fan, since that was also pretty loud. The whining noise is gone and I've quadrupled the storage space. Now that the whine is gone, I can hear the actual drive access clicks and whirs, which is a little distracting. The new fan also didn't make a difference and may even be louder than the old one. It's hard to tell, since the old fan noise was drowned out by the loud hard drive. I've uploaded a few more photos to a Flickr photset.